Be aware, when you have standing lower than 6.67 aka lower than "perfect", then the results might not be 100% accurate because CCP is showing players only 2 decimal numbers for standings. Actually ingame calculations in the back are done with more than 2 decimals, therefore there is no way of calculating 100% accurate. 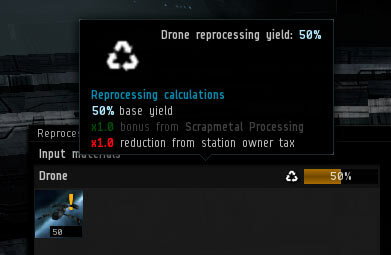 Choose item to reprocess. Autocomplete activates from third character. You can copy items from ingame hangar by selecting wanted items and using ctrl + c key combination in Details or List view. Icons view does not have copy feature ingame. Add materials to warehouse button adds "Materials you receive" table materials to warehouse. It will use quantity column as quantity and one unit price fields as price, so be sure to fill those price fields. If any type of material does not exist in warehouse, it will be added automatically. You must configure auto buy/sell settings for these yourself from warehouse page.